The new kid on the block, and one not to be underestimated, is Prime Gelato, located right by the New Oxford Street end of Shaftesbury. Founded by a Genoese pastry chef, Prime Gelato has a minimum of 6 vegan gelatos at all times (and plenty of sorbets that are all vegan). The coffee hazelnut and roasted almond are highly recommended. First off we’ve got La Gelatiera, located in Covent Garden (a short walk from Leicester Square). It’s not uncommon to find vegan friendly sorbets, but it makes all the difference when a shop labels their products (it may not seem like an issue, but constantly asking about ingredients can be exhausting). My positive feelings toward this business also stem from the owner’s willingness to discuss his shop with some random blogger off the street (and it’s quite obvious there’s a lot of passion behind what he’s doing). I’ve stopped by the shop a few times now and they always seem to have at least four or five vegan options (always on your left, front row, as you face the counter). The chocolate chili is sublime (only a tiny fraction of a kick) and the fruit flavours are all natural and refreshing. Almost as ace as the fact that they make such delicious sorbets is the big plexiglass window in the floor, which sits directly above the kitchen where the ice creams are made. Note to self: remember you wear skirts and dresses 85% of the time. Yorica is a 100% dairy free ice cream shop located on Wardour Street in bustling Soho. Everything they sell is suitable for vegans, including whipped cream and toppings (sprinkles, marshmallows, gummy sweets, fresh fruit, and much more). There are scoopable ice cream options (the cookies and cream was my favourite) and soft serve froyo. Shakes also grace the menu. With a few boutiques across London, Amorino has at least one flavour with the Vegan Society logo attached (organic sicilian citrus). 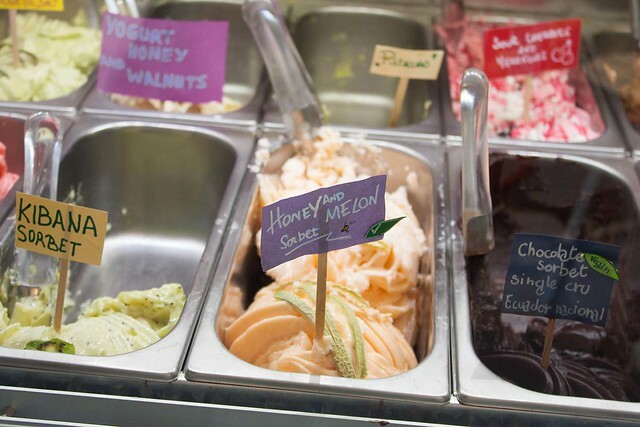 Scoop has a range of vegan friendly fruit sorbets and a dark chocolate sorbet that is suitable for vegans. They also have vegan churros (at the Brewer Street branch, at least)! London vegans rave over this place, which features a range of dairy free frozen treats (usually several at any time). Predictably, the chocolate gets great reviews, but you will also find (depending on the day) colourful vegan flavours like coffee, coconut, avocado, blood orange, coconut, and raspberry. I’ve even heard rumour of a Pimms sorbet. A few chocolate and fruit flavour sorbets grace the menu and there’s an allergen chart on their website that makes it obvious what is and isn’t vegan. These guys serve chocolate with sea salt sorbet that is vegan (along with perhaps some other flavours). I’ve seen the kitchen of the Richmond branch and the owner knocks up some insanely good vegan sorbets and is inventive with flavours. She understands very what what vegan means. Snowflakes lists their vegan sorbets on the company website, and flavours include the usual fruity suspects plus intriguing flavours like kiwi banana and apple elderflower. This nearly 100% vegan business has a selection of cashew based scoopable ice cream. This is a good option if you want a vegan option that isn’t sorbet. This liquid nitrogen ice cream parlour nearly always has a dairy free option. They have been producing both mango and chocolate soft serve vegan ice creams for years (or a mix, which I recommend). Please note the Covent Garden branch is now closed. They have re-opened in Fulham and I’m not sure what ice cream they are serving (but I’m 99% certain it’s the same). A reader recently alerted to me to a tasty coconut sorbet available from Oddono’s. There are a few branches around London, but the location where the coconut sorbet was found is in the food hall at Selfridges. Another dairy free ice cream option in Soho, Lick showcases a selection of flavours to include some tropical fruit sorbets that are vegan. Chocolate too, of course. Ms Cupcake in Brixton turns out a mean milkshake, which you can also order topped with vegan whipped cream. I recommend the chocolate peanut butter or the Oreo. These are my go to milkshakes in London. Cookies and Scream in Camden, also well known for excellent milkshakes, whiz up a superbly rich variety of flavours (the salted caramel is recommended). Of course I know there are more London vegan ice cream options that either aren’t yet on my radar or have slipped my mind. Do you have any favourites not on this list? Please let me know in the comments below and I’ll add it to the list. Yes, this is the same Tutti Fruiti as the well known American chain, and yes the rumours of a vegan froyo are correct. It tastes nothing like frozen yoghurt and, according to a staff member, costs twice as much as other flavours (the place runs on a pay by weight system), but it’s also not overly sweet and is one of the best treats you can have on a hot summer’s day. Plus you can top your froyo with an array of toppings, including a great selection of fresh fruits. The flavours vary on any given day, but they always seem to have the soya frozen yoghurt (very end tap). The list of possible flavours includes three other vegan options (watermelon sorbet, orange sorbet, and pink lemonade), but I’ve yet to see any of these appear in store. In fact the staff seemed on more than one occasion a little unsure about the whole concept of the dairy free line. I haven’t heard of La Gelatiera, definitely going to have to check that out (chilli chocolate sounds great!). My favourite place for vegan ice cream in London is Scoop (scoopgelato.com), which has a location on Shorts Gardens in Covent Garden and another near Piccadilly Circus. They label all their flavours with little pictures to show allergens (milk, egg and gluten). Their extra dark chocolate is amazing — if you can find it. They frequently sell out it’s so good! Excellent, thanks for the recommendation! I’ve walked by loads of times but have never gone in. Will deffo give it a try. There is also Gelupo Gelateria in Soho / Piccadilly Circus (not far from Scoop who rarely seems to have my favourite extra dark chocolate gelato these days). The vegan flavours are listed on the right hand side of the board. They have always had bitter chocolate when I’ve been in as well as coconut, blood orange and other fruity flavours which vary. They also do granita. Excellent, thanks! Another to add to the list of places of try.